Belatedly, here's the list of the Hugo Award winners in the four fiction categories (there are many additional categories) for 2017. These awards were presented in August 2017 at Worldcon 75 in Helsinki, Finland. The list of finalists or nominees can be seen in the previous post. A little more than a week from now, on Friday, August 11, the 2017 Hugo Awards will be presented at this year's World Science Fiction Convention, Worldcon 75 in Helsinki, Finland. 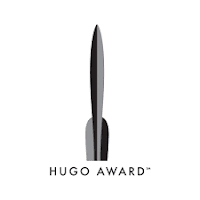 The Hugo Awards ceremony is always a highlight of a Worldcon. Here's a list of the finalists in the four fiction categories (there are many additional categories), offered without comment, just in case you, like me (Amy), need a little reminder of the works that are up for these awards this year. May good stuff win! 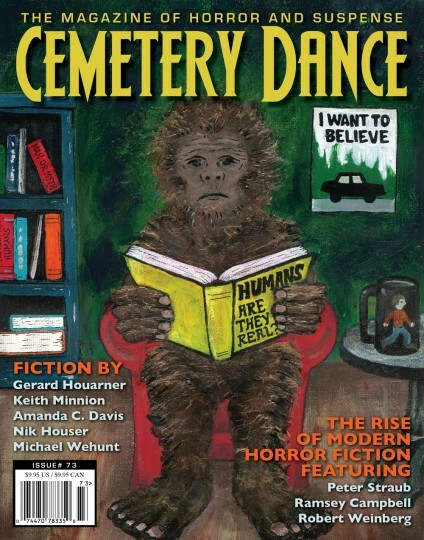 My Story Recommendation of the Week is for "Voices Without Voices, Words With No Words" by Amanda C. Davis, from Issue #73 of Cemetery Dance magazine. Jeremy lives in a house inherited from his parents, a house with no power, no heat, no telephone. He has lost his job, his girlfriend, his life. Because he has time for nothing but his work. His work is: he picks up a dead phone and hears voices. He writes down names, numbers, and words that the voices give him. Then he goes to one of the few remaining pay phones in town with a stack of quarters. He dials the numbers, asks for the names, and tells them the words. Words like "Choose the green" or "Stop at two" or "Ask for Veronica." So Jeremy is a loon, right? Except it's easy to believe he's not. For one thing, how come he can always reach someone with the right name at the numbers he dials? This is a guy who has devoted himself to work he didn't choose, at tremendous cost to himself, in the hope it's helping people he doesn't even know. He is a sad, pathetic, very noble character. Like someone who leaves a high-paying job to work with the homeless, or perhaps even a writer who devotes her life to telling stories she's not sure anyone else appreciates. The story begins in earnest when Jeremy dials a number but it doesn't ring. He looks down and realizes it's his number, for his disconnected home phone. The message is for him: It ends. Be at the side of the lost queen at midnight. Twenty-five twenty-one. Will he puzzle out by midnight what that means? This is a fairly simple story concept, executed cleanly and elegantly. I've been reading a lot of short fiction lately and I fear I've been getting a bit jaded – it's hard right now to get me to really care about what happens to a character in a short story. But Amanda Davis pulled it off. I was right there with Jeremy to the end of the story. I enjoyed "Voices Without Voices, Words With No Words" very much. Amanda C. Davis writes horror, dark fantasy, and science fiction. Her work has appeared in Daily Science Fiction, Orson Scott Card's InterGalactic Medicine Show, Shock Totem, and many other publications. Incidentally, I think of Cemetery Dance as a horror magazine, but to me "Voices Without Voices, Words With No Words" is not a horror story. Good for them stretching their boundaries to publish such a terrific piece!